I wash dishes and clean tables. I take out the trash. I clean toilets, sweep and mop floors. Before the lights go out I make sure the counters are wiped clean and all the chairs are pushed in under the table. You see, I’m a busboy and I’m proud of it. Someone once asked me, “What are you?” and I politely responded, “I’m a busboy”. They looked perplexed. I was wearing a Hickey Freeman suit, a Zegna tie and my cap toe Canali shoes glistened in the tropical sun. Sure, I was an executive with one of the most prestigious hotel chains in the world. But the question deserved the right answer. You see, I am a busboy. Great titles are a dime a dozen. What was that job that taught you the value of where you stand today? What one role did you play that you value above others? When you see a person today executing that same job, do you treat them the way you wanted to be treated when you were there? I hope so. Funny thing is, I’m still a busboy. My wife is actually glad I am because I can wash dishes, clean toilets and do all those other things a busboy does. Being a busboy got me where I am today. I admired the waiters, I admired the short order cooks. I wanted to be one of them. I wanted to make those tips, get to make people smile and cook really good food. So I made sure I was the best darn busboy there ever was. Greasetrap clogged – I’m on it. Broken dishes in section one – I’ve got it. Baby bottle spill on table 26 – count on me! Yes, I got that waiter job, the short order cook job and a shift supervisor job. I worked as a broiler man and became an assistant chef under a Michelin rated chef. I worked at Four Star New York Times restaurants and went on to become an Assistant Maitre d’ at the number one Conde Nast Hotel on the planet. I served Pope John Paul II, escorted three US Presidents, helped Steven Tyler and Aerosmith with reservations for dinner and actually have an autographed Chuck Barris Gong Show hat! Corporate Vice President – I had that title! I founded my own agency and gave myself the title President. Now I have titles like master storyteller, partner and a Founder/CEO. But really, the title that mattered the most was busboy and I’m proud of it. 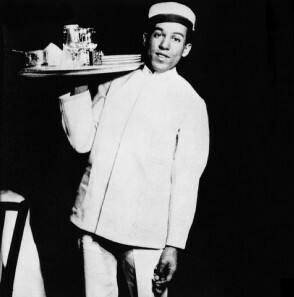 If I had never been a busboy, I’d never be where I am today. I relished and learned at every step along my path. Being a busboy taught me that the little things do matter. I needed to keep my restaurant clean enough for me to eat there so others would. My business today is the same. I can’t expect my customers or investors to buy services or stock that I wouldn’t buy. You see, I’m still a busboy making sure that the product is fit for all to consume.